← Burmese Surprise: Tea Leaf Salad is a Dessert! Trust me, I could eat sushi everyday of my life. 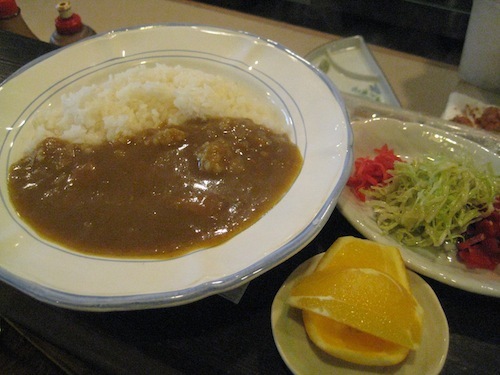 But on a dreary, wet, cold December afternoon, I crave a grandmother’s warm home cooking. My grandmother would whip me up some chicken soup and brisket at the drop of a babushka. But since she’s not around anymore, I search out a surrogate, and while I’m at it, why not a Japanese grandmother this time? Noriko Taniguchi fills the bill perfectly. 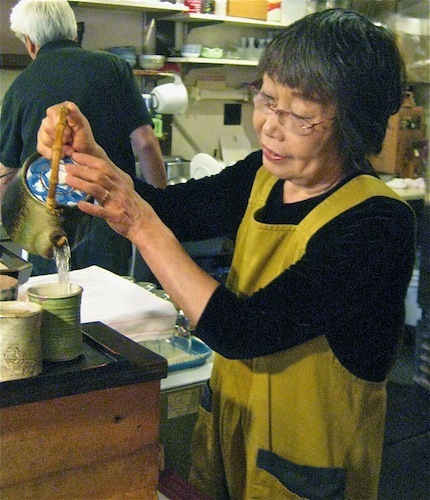 For 17 years, she and her husband Takumi have been cooking up comfort food for appreciative regulars in Norikonoko, their cozy little restaurant on Telegraph Avenue in Berkeley. The worn wooden floors and assorted Japanese tchotchkes (tiny owls, plastic and wooden figurines arranged on miniature shelves) look like they have been here forever; just like the treasures at my grandmother’s house. Japanese home-style cooking does not include the thick, showy sushi rolls with mango, cream cheese and the kitchen sink available at many a Japanese restaurant any day of the year. The dishes here are more modest and follow the Japanese emphasis on seasonality, reflecting the time of year and weather. Today’s offerings at Norikonoko include stick-to-your-ribs warming foods, like oden (a winter hot-pot dish with fish and yam cakes simmered for hours in a kelp-based broth), a buckwheat soba noodle soup with vegetables and a spicy pork curry — of which Noriko is rather proud, “It takes three hours of special cooking,” she says. As Noriko bustles around, greeting guests, pouring tea, serving up sides, her husband mans the grill. 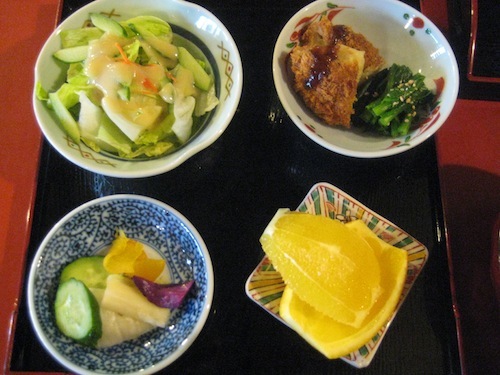 He does grilled chicken, salmon, corn, or a whole split mackerel served with its traditional accompaniment, grated daikon radish. The array of side dishes is an important element in Japanese family meals and Noriko brings a black lacquer tray with teensy dishes holding vegetables, salad, and pickles, carefully arrayed to display their contrasting colors. On this day, the standout side is a sweet onion croquette served with spinach. The crunchy panko coating gives way to a warm and comforting creaminess within. For dessert, I am leaning towards Taiyaki, cute fish-shaped waffles filled with red bean paste, but Noriko gently steers me in the direction her homemade Mushi Yokan, thick brown disks of steamed cake made from buckwheat, sweet potato and red bean paste. It’s listed as seasonal, because, she explains, it depends on what kind of sweet potato she can find. 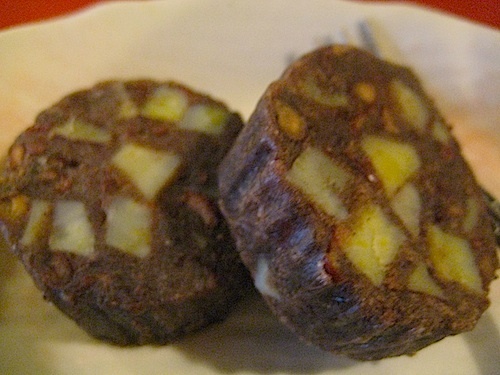 It’s not too sweet, tastes fresh and healthy; exactly what a grandmother would make. 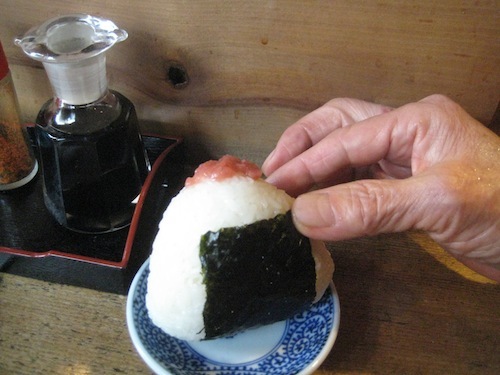 This entry was posted in gluten-free food, Japan and tagged Japanese homestyle cooking, Norikonoko, onigiri, ume. Bookmark the permalink.